Healthy, Fit, and Focused: Taco Tuesday! 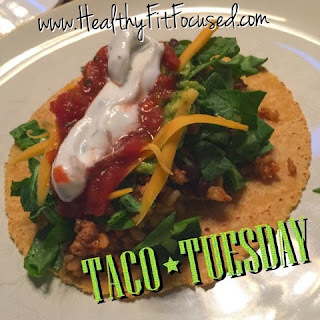 Clean Eating Tacos!! I know today is Wednesday... but, this was our dinner last night for Taco Tuesday!! It's a favorite in our house! It's the one meal that I know everyone gladly chows down every single week without complaining! It's quick and easy and it's a winner all around and we never want to miss it! So, this recipe has evolved over the years as our family has grown and they now eat a LOT more food!! What used to be my 1 lb of ground turkey meat suddenly wasn't enough to feed the masses! So, I've had to find different ways of increasing bulk but not sacrificing taste or healthiness! What I started doing, which has worked wonderfully, is adding black beans and brown rice to my ground turkey and it still tastes the same but makes the meat go a lot further! The amount you add of each is totally up to you, depending on how far you need for the meal to go!! After the meat and rice are cooked, mix all the above ingredients together until heated. Julie, it look as if you serve your taco filling on some type of shell. What do you use?